www.lulu.com Object of Deployment Juliet Madsen Book I wrote about my experiences over the last few years, since being injured while serving with the Army in Operation Iraqi Freedom. Free downloadable copies available on lulu or paperback books whose proceeds go directly to the Veteran's Book Project. I do not benefit financially from these books or the majority of my art. We have made it into multiple magazines likeThe Quilt Life Magazine August 2012, Newsweek, Washington Post, Denver Post, Unlimited Possibilities and Quilting Arts Magazine. My quilts have hung at the Denver Capital Building, many quilt shows, and one quilt was dedicated to the Veteran's Administration Medical Center in Denver. We are featured in a book, a documentary, and many web sites... We were even on CNN during the Thanksgiving Weekend because of the following link for the CNN Hero Award Nominee. Designer for Fashion has Heart Non-Profit Veteran project, designing shirts, bag, and hiking boots promoting veterans and their injuries 05/ 2014. Published The Quilt Life magazine, August 2012 pages 28-31. Invisible Disabilities Association Ambassador 2010- Current, IDA Volunteer Award 2011. KKTV Colorado Springs, CO “Using Art to Deal with PTSD” Report by Alyssa Chin 10/2011. Daughters of the American Revolution: Colorado’s Outstanding Veteran Volunteer Award 2010. Wounded Warrior Project, “Art Therapy Helps Heal Wounds” by Chris Wheeler 02/2010. 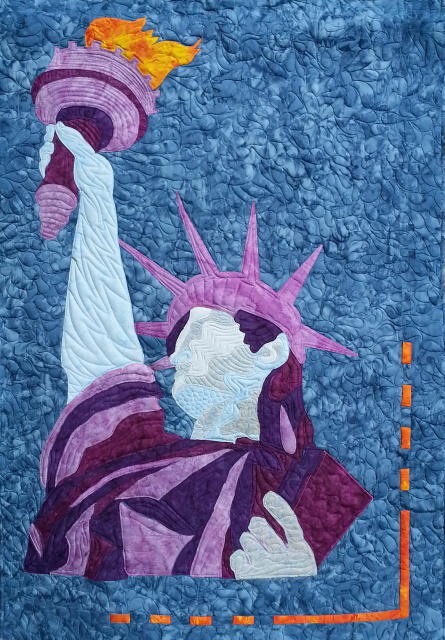 The Daily Sentinel, “Disabled Vet Uses Quilting to Help Heal War Wounds” by BA Haller 02/2010. 2010 National Wheel Chair Games; The Veteran to carry the Torch to the caldron and light it, starting the games. Created, Developed, and Produced Ultimate Sew-In & Auction Denver, CO 2010 benefiting National Wheelchair Games hosted in Denver, CO 2010. Unlimited Possibilities Quilting Merit Scholarship Award 2009. Multiple Radio Interviews by Rick Crandall Studio KEZW 2009/2010. Americans Wartime Museum, “Profiles of American Service: Peter and Juliet Madsen” by Carly Wain 03/2009. CBS News “U.S. Soldiers Get Comfort in Pay It 4ward Project” Reported by Suzanne Carroll Denver, CO 2009. The Denver Post, “Porter: Sewing the Seeds of Kindness” by William Porter 02/2009. Veteran News, National Veterans Wheelchair Games, “Disabled Veteran’s Quilts to Benefit Other Disabled Veterans” 08/2009. Thank you for all the faith you have had in me and my work.